Behold, the learning of Zohar arouses mercy and the spirit of the Mashiach, and it reveals and builds the Beit Hamikdash and allows Israel to dwell securely, and one who studies it will certainly not suffer any of the birth pains of the Mashiach. Therefore, we the rabbis and chachamim of the holy city of Jerusalem as well as it's Battei Dinim have aroused ourselves to establish learning of the Zohar both in Israel and in Chutz LaAretz in order to complete 1000 siyumim of the Zohar. Moshe Rabbenu, Eliyahu Hanavi and Rebbe Shimon Bar Yochai may peace be upon them, have all said that with the sefer HaZohar we will be redeemed from our exile with mercy. 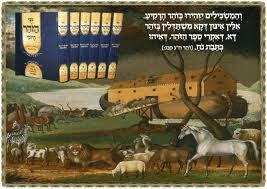 Only those who read the Zohar will enter into the 'Noach's Ark' of our generation which is the Holy Zohar. "In the future, when Am Yisrael will merit to taste from the Tree of Life which is this book of the Zohar, they will be redeemed from their exile with mercy" (Zohar parashat Nasso).